We’re back from the SEMA MPMC conference, in one piece no less. So why not close off the week with something really cool, like this slammed Stout pickup? 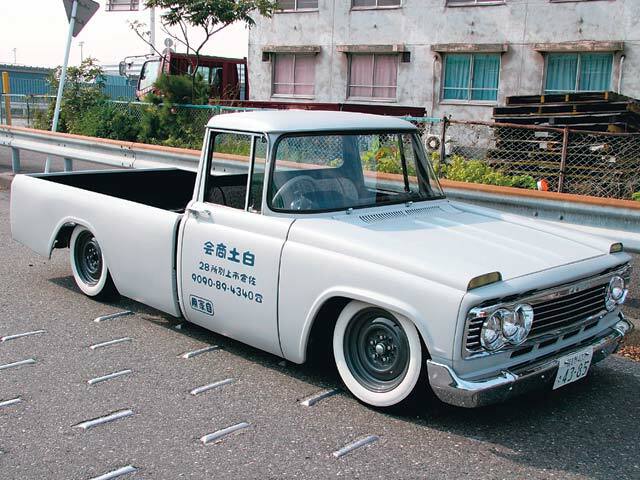 Once in a while the folks at Mini Truckin’ unearth a gem like this 1973 model owned by Masairo Shirato of Chiba Prefecture. 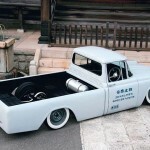 Equipped with an air suspension, this pre-Hilux Toyota pickup was slammed a whopping nine inches by Janis Car Service. Compare the ride height with this stock one that Toyota displayed at the SEMA show a few years ago. You may also notice extensive body work done to the bed, which had 3.5 inches lopped off the top and another three inches stretched between the cab and rear axle. Incidentally, that axle is from an AE86. The resulting stance and painted steelie/whitewall look give the truck a killer “rat” look. JNC approves! 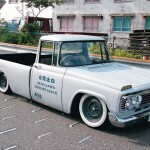 For more madness from Mini Truckin’, check out this Datsun 620 and a pair of NL320s. tagged: toyota, toyota pickup, toyota stout, toyota truck. Nice work on that Toyota mini truck. It does have the “Rat” look alright.